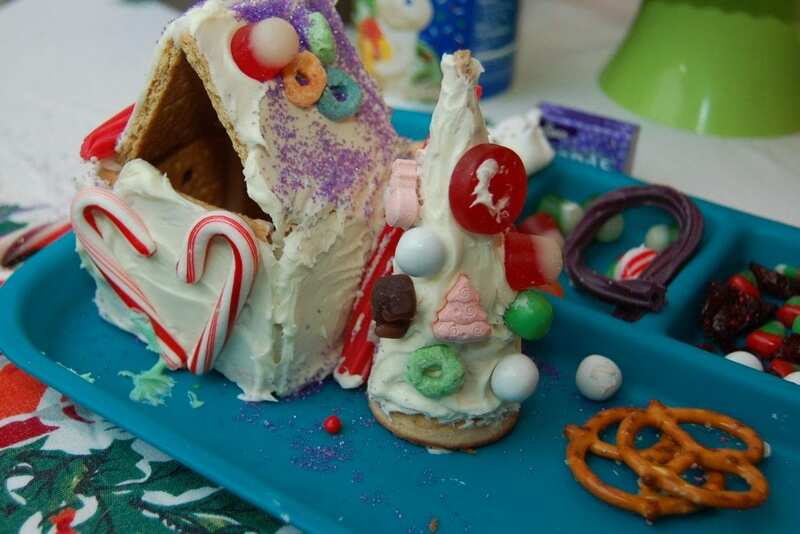 It just would not be Christmas time with the kids if gingerbread houses were not made. You may think I love to do everything DIY style and from scratch, but during the holidays I am all about cutting corners. 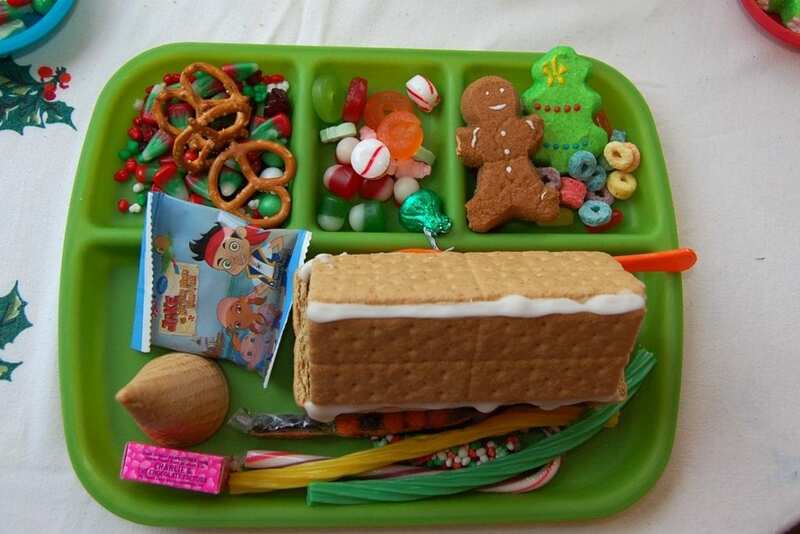 If I could find a peanut free gingerbread house kit with all parts included I’d be all over it. Sadly, as of last year this was a pipe dream. I’m not about to let my son’s peanut allergy keep him from rotting his teeth out of his head and oh ya possibly foster a career in architecture. I decided to just make my own version and throw a party while I was at it. After spending an afternoon reading labels at the grocery store I came home with bags full of colorful and completely un-healthy candy home decor. 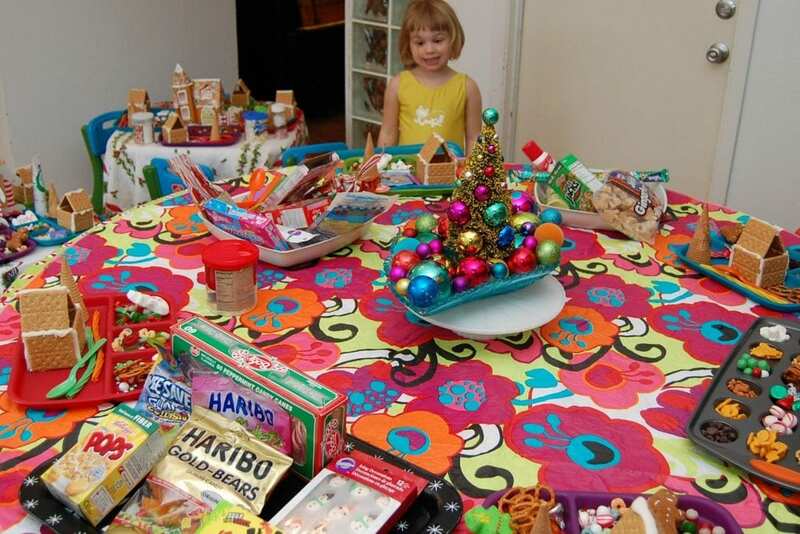 Here is Tallulah having her mind blown out looking at all this completely un-nutrious loot. 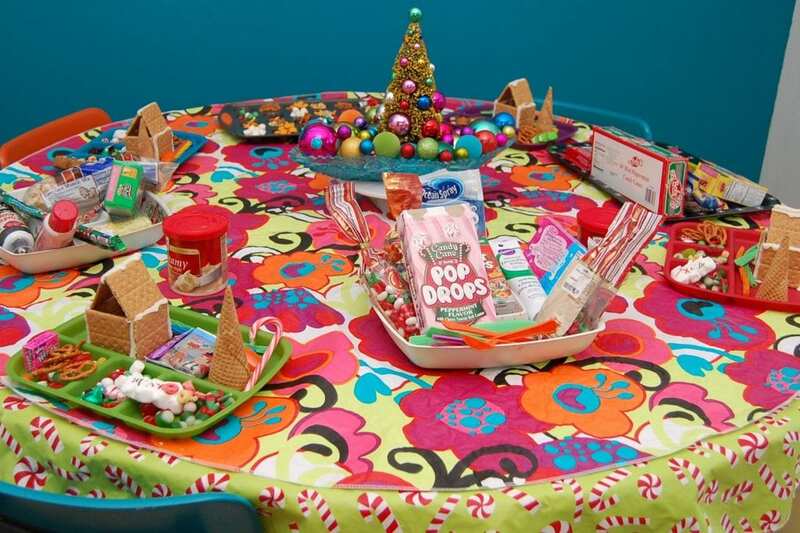 Think beyond candy – cereal, pretzels, goldfish and more look great on gingerbread houses. For the party portion I set up little individual stations. I pre-made each house with icing and graham crackers. Each child also got a sugar cone to make into a tree or possibly a tee-pee. Activities like these are why I hoard plastic trays with separate slots. 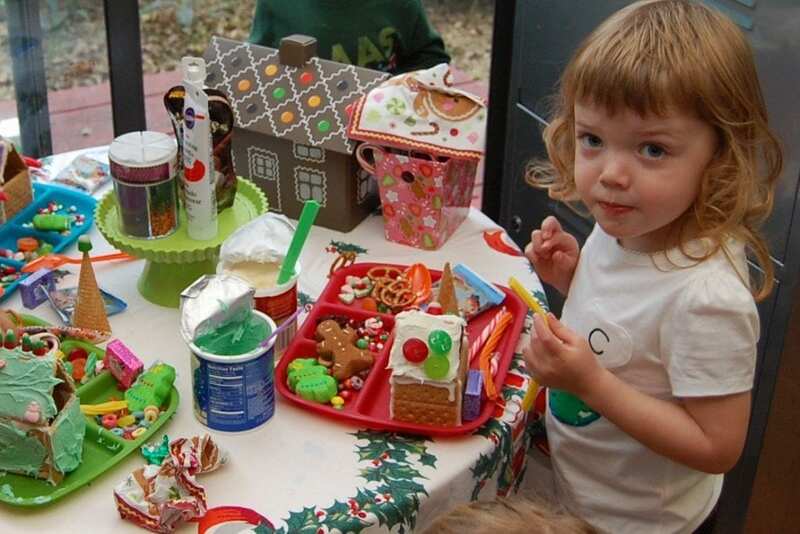 If you don’t like messes, don’t throw a gingerbread house making party. Consider yourself warned. You will be sweeping up sprinkles and having your feet stick to the floor until after the new year. The smile on the faces of those kids so hyped up in sugar they throw up on the way home is worth it. No really one poor kid ralphed from all the sweets. Unleash the kids! We used icing as our “glue” and it worked great. The kids decorated, snacked, decorated, snacked – rinse and repeat. Baxter was a bit young to truly enjoy this lavish peanut free set up in his honor, but all the other kids were thankful. 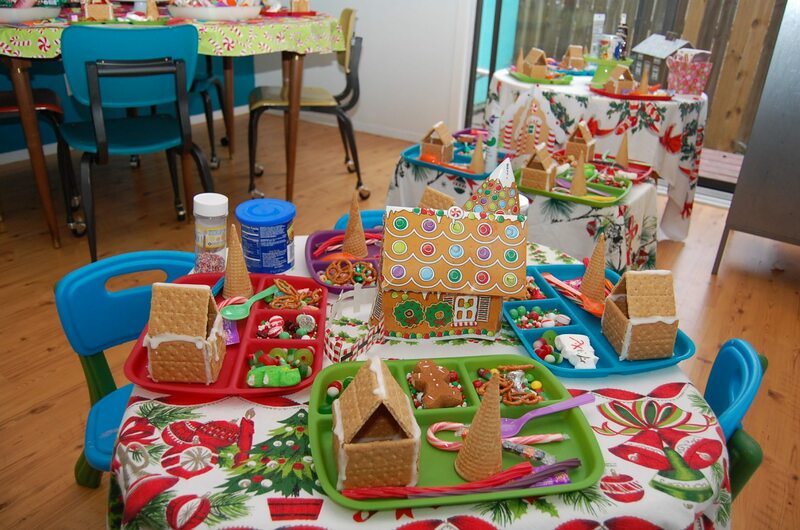 The kids beamed with pride at their gingerbread houses when it was all over and I mopped floors repeatedly. Totally worth it. I’d do it again in a heartbeat. Any excuse to throw a party and I’m in. 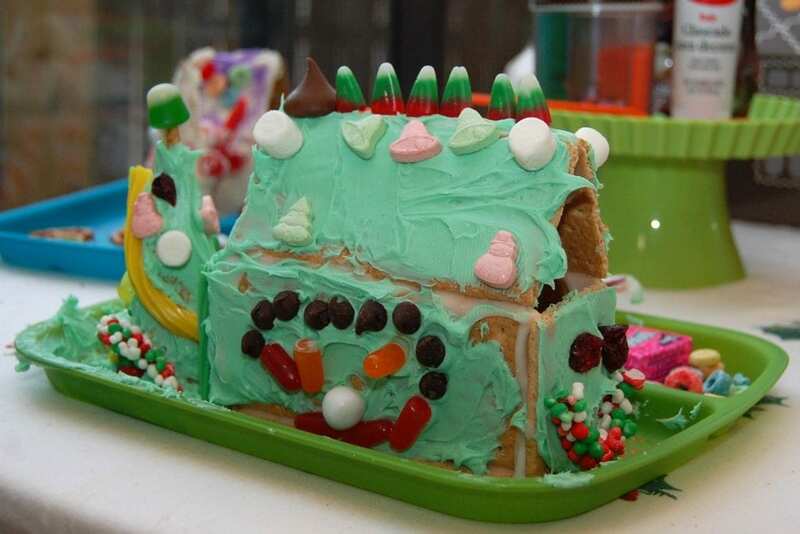 What are your favorite things to adorn your gingerbread house with? Posted December 1, 2014 & filed under Christmas, Cooking Crafts, Crafts, Holidays. This is a terrific idea. Can we have a list of the decorating items you had? It looks like I see licorice (Twizzlers, maybe)? goldfish, chocolate chips, peppermints… what else? Is premaking the houses mandatory?